Buddha-Mom Tea : Qi Lai Shan, tea from a snowy mountain. Qi Lai Shan, tea from a snowy mountain. Located in a remote, pristine high elevation garden on the edge of a national forest Qi Lai Shan is close to Li Shan. Even in Taiwan, Qi Lai Shan is a still largely unknown growing region. This is because this area is relatively new to tea cultivation. Only locals who know where the best tea in Taiwan is know about Qi Lai Shan. This tea is grown at 2050m. The dry leaves have a clean fragrance of high mountains. The taste is pure and buttery with a long smooth aftertaste. This year it snowed in Qi Lai Shan during the winter, making this spring's tea "snow tea." 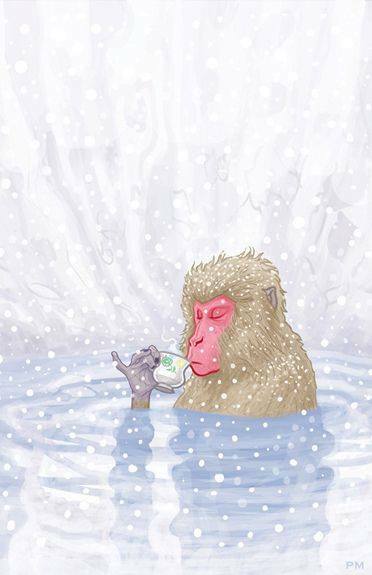 Because of its rarity, snow tea is renowned for its excellence. That is a bit of copy and paste for you from the website run by the honorable and lovely young man, Emilio who is a fabulous potter as well as a purveyor of some rare teas! The Jade Leaf. Tell him Hannah sent ya! Time to feed the hippo.